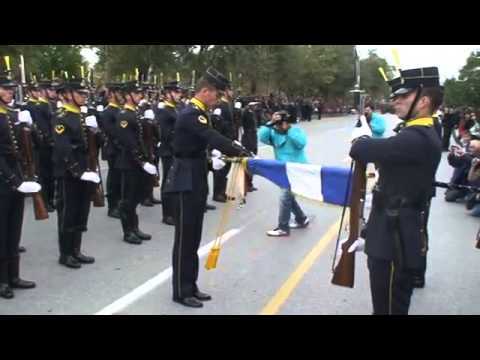 The ceremony of unfolding the flag of the Hellenic Army Academy before parading in the OXI day. Ohi Day (also spelled Ochi Day, Greek: Επέτειος του «’Οχι»[needs IPA] Epeteios tou “‘Ohi”, Anniversary of the “No”) is celebrated throughout Greece, Cyprus and the Greek communities around the world on October 28 each year, to commemorate the rejection by Greek Prime Minister Ioannis Metaxas (in power from August 4, 1936, until January 29, 1941) of the ultimatum made by Italian dictator Benito Mussolini on October 28, 1940. This entry was posted on Monday, November 3rd, 2014 at 12:32 am and is filed under ARMED FORCES. You can follow any responses to this entry through the RSS 2.0 feed. Both comments and pings are currently closed.